Genesis is a centre for Advanced Cosmetology and Laser therapies. It is a super-speciality dermato-cosmetology centre having Skin specialist, Hair transplant Surgeon, Dentist, Aesthetician, Physiotherapist and Dietician under the same roof. MP-CG's first "Aesthetic Laser Centre" equipped with 6 types of cosmetological lasers. Almost 50% of men by 50 years of age complaint of hair loss and almost 40% of women suffer from hair loss by 40 years of age. Androgenetic alopecia is reduction of hair roots because of aging process. This is most likely due to normal hormonal effect on the hair roots seen in both males & females after 30+ years of age. In Alopecia areata there are small coin like patches seen on the scalp, mostly seen in young age. To retain your crowning glory we provide various scientific medical and advanced treatments. (a) Oral Medicines – Include Biotin, Anti-oxidants, Iron-calcium supplements. (b) Topical application – Minoxidil (2-10%) along with revitalizing shampoo & conditioners are advised. (c) Derma roller therapy – In this treatment a special roller having multiple micro needles is rolled over the scalp to create multiple micro-channels through which various growth factors vitamins and minerals are pushed. (d) Stem cell therapy – Highly purified stem cell activator solution are used this has capacity to regenerate dead hair follicles. (e) Electroporation therapy & injection - There are few chemicals available which can be pushed directly into the scalp for hair growth, they provide very effective hair loss control, also know as needleless mesotherapy . 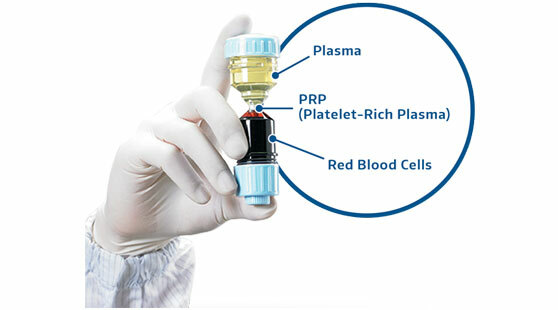 (f) Platlet rich plasma - (prp therapy ) This is a most recent and extremely effective technique in hair loss treatment. It's a non-surgical hair restoration procedure, where blood is taken from the client (just like a blood test), centrifuged and injected into the scalp. Platelets and growth factors from the blood are capable of regenerating new hair follicles, stimulating dead hair follicles and growing new hair. (g) Laser low level light therapy - Infrared light (800 nm) give thicker and healthier hair by improving circulation in hair roots we use “I- clear” light system by cure light tm (US). Pain factor - We use topical anaesthesia (numbress cream) applied 30 minutes before almost all treatment to make the procedure comfortable. 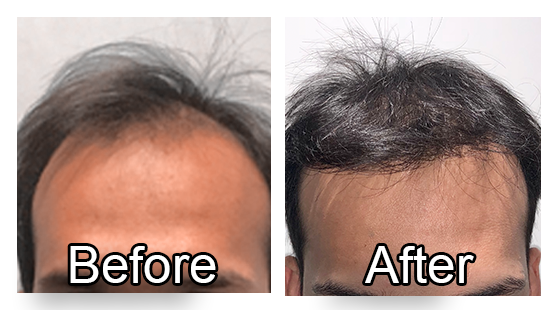 (h) Hair Transplantation :- Bald patients who don't get satisfactory improvements with real-time medical treatment & mesotherapy are advised to go for permanent hair growth solution i.e Hair transplantation. 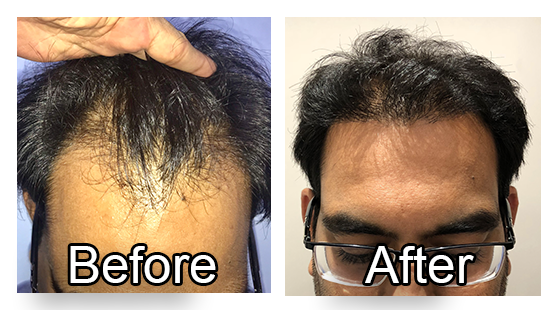 Hair transplantation is the most efficient and result oriented way of restoring hair since it gives permanent solution to baldness and is maintenance free in long term. 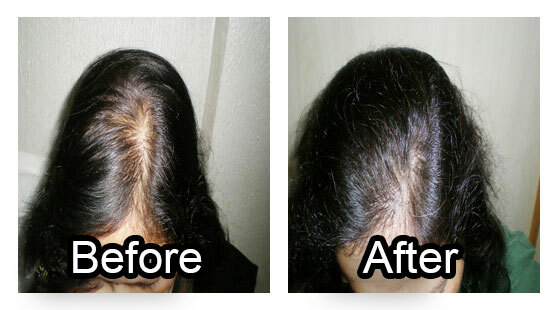 It is a miraculous invention of science which makes regrowth of hair possible in the most effective and painless way. It is a boon for those who have failed repeatedly in trying to get a relief from hairfall and have started losing hair or have already lost hair. 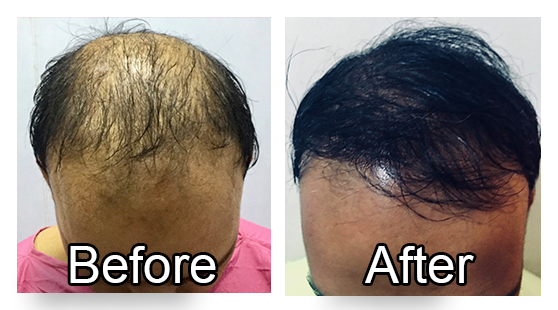 After successful hair transplantation, bald area of the scalp gets converted into a fully regrown hair zone that changes the individual's personality. 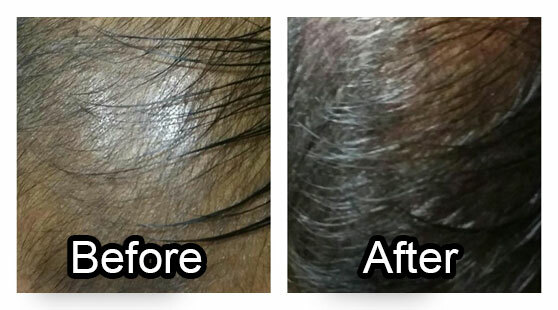 In this procedure, the surgeon takes healthy grafts with hair roots from one location (usually the back area of scalp) and relocates them to bald area of the head. Each hair graft harvested from the donor area is carefully transplanted by the surgeon on to the recipient area so as to match the patient's previous hair growth pattern i.e Hair line where the new hair will continue to grow in their natural course. Transplanted hair can be treated just like normal hair, which means you can cut, colour and style them the way you like. At the time of the procedure, surgeons carefully choose the method of transplant. It may be Follicular Unit Extraction(FUE) or Follicular Unit Hair Transplant(FUHT) or a combination of both. The selection of method depends on the extent of hair loss, the availability of donor area and place of transplantation of grafts as well. The FUT & FUE hair transplants are technically differentiated on the way of the graft extraction/harvesting. After the harvesting /extracting of grafts, both the procedures FUT and FUE are same and both the procedures will make patient experience next to no pain if performed well. Hair transplant not only changes the facial looks of an individual by hair regrowth but also is a wonderful modality for concealing spotted marks, burnt skin and accidental scares in the hair bearing regions.